Saint Patrick was born somewhere in 5th century Roman occupied Britian (England or Scotland based on various sources) and spent a few years in captivity as a young man to Irish pirates, before returning as a missionary to the emerald isle. It is ironic that the patron saint of Ireland isn't even Irish? What better way to segue into a St Patrick's day special that also isn't Irish. 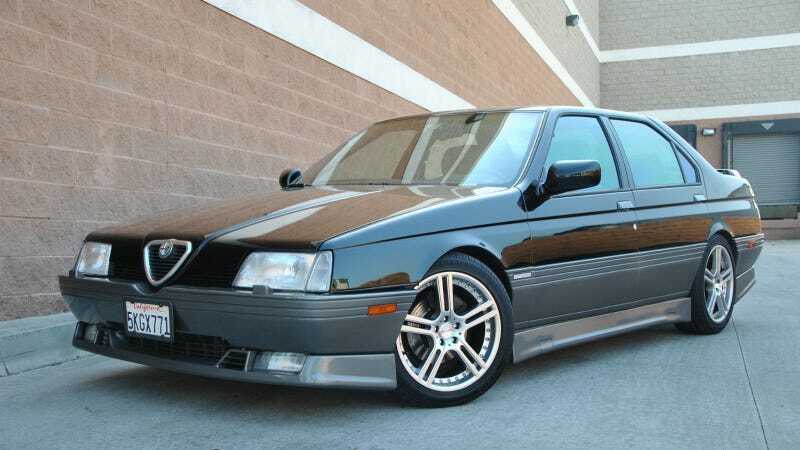 Find this 1995 Alfa Romeo 164 Quadrifoglio for sale in Signal Hill, CA currently bidding for $4,050 reserve-not-met with 6 days to go. This Alfa Romeo 164's connection to St Patrick's day is the use of the Quadrifoglio (four leaf clover) emblem and designation. Alfa started using the quadrifoglio on its racing cars in the 1920s, but modern examples (such as the above 164) use the emblem to denote a high end version of a particular car. The 164 was the front-drive replacement to the 90 (and earlier Alfetta) executive sedan, slotting above the 75 (known as the Milano in North America) platform. The 3.0 liter V6 is rated at 210 horsepower (230 with larger valves and a recent rebuild according to the seller) and mated to the front wheels via a 5-speed gearbox. The Pininfarina designed 164 easily has a spot in our list of top ten front-drive sedans that are fun to drive. 5k: St Patrick's Day: 1995 Alfa Romeo 164 Quadrifoglio on Daily Turismo.